Bite-size portions of raw cookie dough, covered with dark chocolate and Dutch syrup waffles! There is just so much deliciousness going on in these tiny little bites. Creamy fudgy raw cookie dough with a layer of bitter dark chocolate, finished off with a sprinkle of syrupy caramel cookies. This one is so easy to make but oh so delicious! 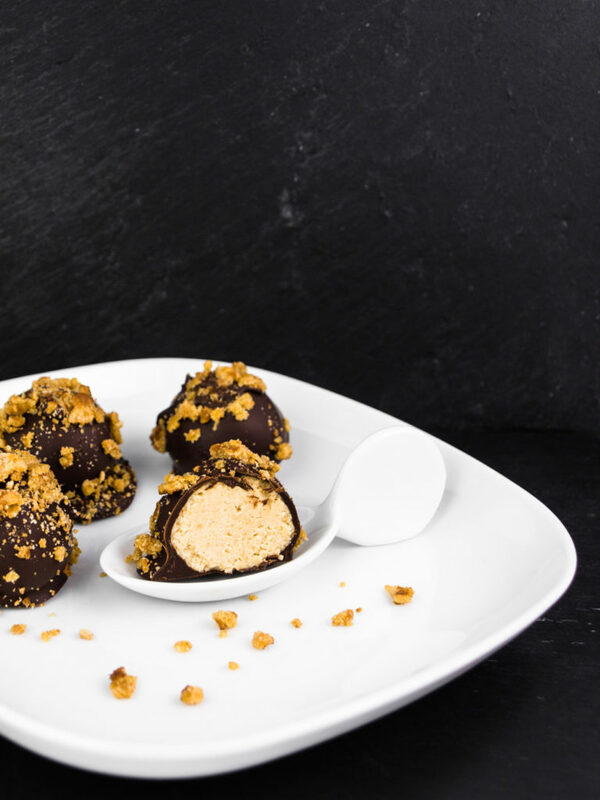 The filling of your truffles will be something that tastes exactly like raw cookie dough without all the worries of raw egg in there. Just combine dry buttery cookies with cream cheese and you will have a filling that is just as delicious as the cookie dough you love to lick from the back of the spoon! The original recipe calls for two types of Dutch cookies. Jodenkoek – translates to Jewish cake – is a dry buttery cookie similar to the French sprits or sable. Outside of the Netherlands you probably won’t find this exact kind of cookie, but every dry buttery cookie will do! They are all delicious! For the sprinkles of the outside crumbled Dutch “Stroopwafels” work perfectly. These Dutch waffles are caramelized crunchy while being filled with gooey syrup. Whenever you have a chance to taste them, you definitely should! Alternatively, you can use a crunchy but sticky caramel cookie as well. This recipe is inspired by the recipe from the Dutch culinary blog Culy.nl, which they got from Miljuschka Witzenhausen. I used even darker chocolate for a nicer contrast between sweet and bitter in the bites. On top, I made the truffles a lot smaller, giving you more small little nibbles instead of a few bigger ones. What are you waiting for? Make some delicious pieces of no-worry cookie dough with tasty chocolate and Dutch Stroopwafels! Small tasty little bites! You won’t be able to eat just one! Make a delicious filling and cover it in more tasty stuff! Place the buttery cookies in a mixer and keep blending until you have a sand-like texture. Add the cream cheese and keep blending until the two are well combined into a creamy batter. Line a tray with baking paper. Grab a teaspoons worth of batter and shape into a small round ball with your hands. Place on the baking paper and keep rolling small little balls until all batter is gone. You should have about 12 little dough balls. Place in the fridge for 30 minutes to cool and set. Meanwhile, break both types of chocolate into small pieces and melt together with oil au-bain marie style in a pot above hot water. Keep stirring until fully melted and shiny. Also break the Stroopwafel or caramel cookies into tiny little pieces. Use a fork to dip each cooled dough ball into the warm chocolate. Let the excess drip off and place again on the baking paper. Use a spoon to drip some extra molten chocolate onto the balls to cover the fork holes. Immediately sprinkle over the Stroopwafel or caramel cookie pieces onto the chocolate. Use your fingers to slightly push the pieces into the chocolate and make them stick. Place again in the fridge for another 30 minutes to fully make the chocolate set. Dig into your yummy bites and store the rest in the fridge if you are able to resist! What is your favorite cookie to use as filling for truffles? Do you think a different kind of cookie would work even better? Think the Dutch syrupy “Stroopwafels” are over the top? Place your suggestions in the comments below and let’s try to make the best chocolate truffles of all times!